In college when Paul and I were dating, we used to enjoy playing bingo. We were always the youngest people in the smoky bingo hall. This was in the early 90s, and all the ladies playing used to bring troll dolls and stroke their hair for luck. A local park and rec here recently had a family bingo night. We decided to go. It was $1 for a card, and you got to keep the card for the whole night. Talk about a great deal! We played 20 games. Luck wasn't with us on this night, but we had a great time. There were interesting prizes - air mattresses and fish aquariums and chia pets and fishing poles. Every seat was taken. We saw next to three elderly women who were very friendly, and one of them shared her boxes of raisins with the boys. And when a construction worker at the table with Cort won a round, he let Cort go up and get his prize. The prizes were wrapped in newspaper, so you didn't know what it was until you unwrapped it. Cort was proud of his four pack of flashlights. Supposedly, family bingo happens twice a year. We'll be on the lookout for the next event. Fun to set down and enjoy games as a family. My conservation club has it every Friday so have been a caller and helper a lot. How fun. My Mom used to love playing bingo... then she lost her hearing and couldn't go. Very sad for her. That looks like a fun time. I cant even remember the last time I played in real life, but I do play online. i love that they do family night! so cute! Oh my gosh, I forgot all about stroking a troll's head for luck. No wonder I still love my troll dolls! What a fun thing for a family to do together! A chance for the boys to have fun with different age groups too. I love the pictures! I agree, Bingo is good fun for everyone! I used to play Longaberger Bingo. But I have not played any in about ten years. I will have to keep an eye out for local games now. The Catholics have a lot! I have a hilarious picture of a gaggle of blue haired ladies holding trolls, what a picture that would make! 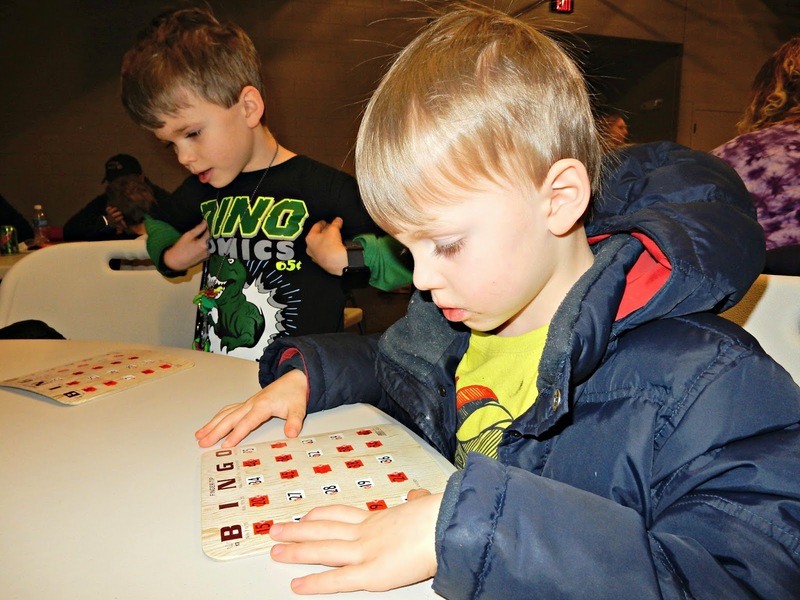 Don't know if they still do it or not but some Catholic Churches offer bingo night once a week.... You'll need to look around for other possibilities for the family --like this one. Sounds like a great time! They have bingo at our local parish every couple of months. My kids adore it, and it is such a cheap night out. Love these! Pierce and Reid were really serious. So cute. And, I love that Cort got the prize; very nice of the gentleman. We play bingo here at home sometimes, but I'm thinking about going to the senior center and try my luck! I never played Bingo. I played Poker, though. Mommy remembers those troll dolls,.. She says she misses hers! OMG...the last time I played bingo was with my grandmother (about twenty years ago). I need to take Lewie--he's at the perfect age for it. Thank you for this reminder! hubby and I were just joking around about me going to a bingo hall to play with the regulars. 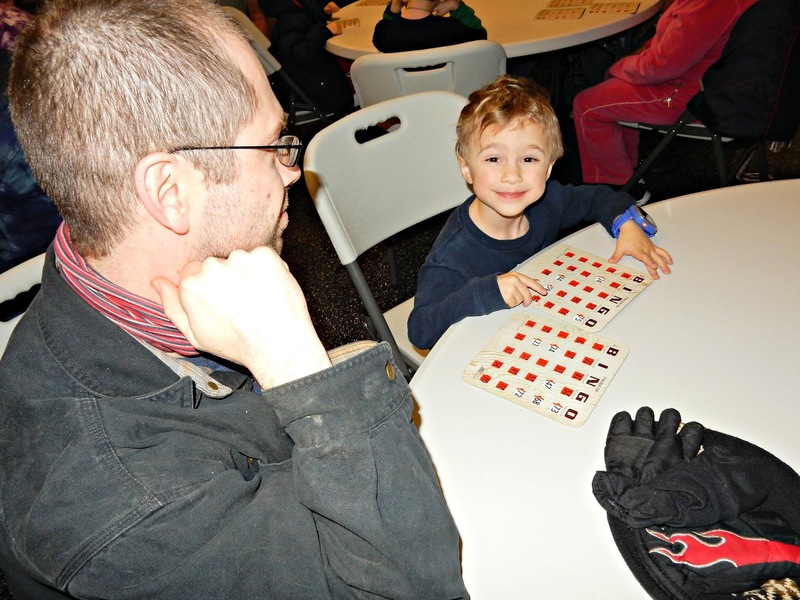 my son would have loved family bingo! That sounds like great fun. I haven't played Bingo in forever!! What a fun thing to do! I think the last time I played was at a baby or bridal shower a few years ago. Definitely not the real deal, though! I have too much trouble following all the cards... but it is fun! What a fun family night. Lisa, you're doing such a great job raising your boys, good for you. I have never played that game. Sounds so interesting! I haven't played in many years. What a fun family night for the 5 of you! That does look like fun! We used to play with extended family on Thanksgiving and Christmas. We haven't done that in awhile. I think some people grew tired of it. Not me! We always chipped in small prizes. I haven't played it in decades. Now that's good clean family fun! Oh man... I don't know that I've EVER played Bingo!